While Wall Street pounds Ford Motor Co.’s response to high-profile, recent trends like self-driving vehicles and the shift from sedans to SUVs, an underappreciated, century-old company mainstay continues to chug along, delivering dominant sales and consistent profits. 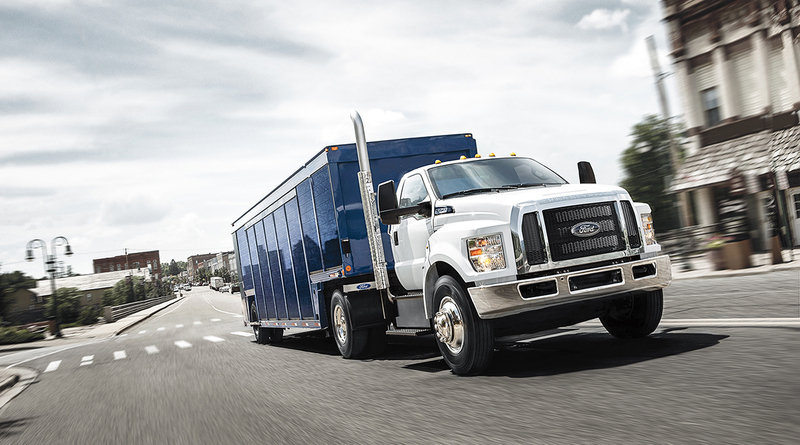 Ford is one of the few automakers with a coordinated global strategy for commercial vehicles. It makes everything from the compact Transit Connect city delivery van to the bigger Transit UPS-style van, countless versions of its Super Duty heavy-duty pickups and behemoths like the F-750 that’s the basis for everything from dump trucks to highway haulers just a step smaller than the biggest 18-wheelers. “It’s a profitable business, and Ford covers the whole range of commercial vehicles, understands their customers and anticipates their needs,” IHS Market senior analyst Stephanie Brinley said. The updated 2019 Transit Connect Class 1 compact van that debuted at the Chicago auto show kicks off the latest round in a seemingly endless series of updates to help Ford commercial vehicles maintain their 42% share and No. 1 position in the U.S. market. A few other manufacturers have a long, consistent track record of developing and devoting top-tier talent to a wide range of commercial vehicles, but Ford is unique in combining global sales volume and resources for a range of vehicles stretching from the Transit Connect and bigger, medium-duty Transit to North American favorites like the F-series. “Ford recognizes the diversity of the market, and all the opportunities that exist,” Kelly Blue Book executive analyst Rebecca Lindland said. To that end, Ford ripped up what was already America’s best-selling CV line earlier this decade, ditching the legendary Econoline/E-series nameplate for the Euro-style Transit, and creating a new market segment with the smaller and more affordable Transit Connect. The E-series had 50% of the market for full-size vans, but Ford bet on the benefits of using a global vehicle and replaced it with the Transit in 2015. Ford surprised the industry when it introduced the global class of compact CVs to American businesses for the 2010 model year. The Transit Connect was smaller and more city-friendly, plus being more affordable and fuel-efficient than the Econoline. A lot of small businesses had been paying more money for more van than they needed. The Transit Connect fit them like a glove and surprisingly won the North American Truck of the Year award. Other automakers followed suit. Nissan added the NV200. Chevrolet buys a version of Nissan’s van and sells it as the City Express. Fiat Chrysler, which is building a CV lineup like Ford by pairing its Euro vans with U.S.-based pickups, responded with the Ram ProMaster City. Ford’s first Transit Connect had a short run in the U.S. because it had already been on sale in Europe for a while. Ford replaced it with a new model for the 2014 model year. “Ford is the only automaker to have equally deep product lines of commercial vehicles in Europe and the U.S.,” Brinley said. Ford is working to raise its CV business to the same level in other parts of the world. The Transit Connect gets an update this year, adding new safety features and a 1.5L-diesel engine Ford promises will deliver at least 30 mpg on the highway. Ford also works closely with upfitters, the companies that make parts businesses use to customize their vehicles, ranging from dog-grooming to catering and utility companies. Ford dove into the commercial vehicle business with its first purpose-built truck in 1916. Unlike other trucks at the time, it had an upgraded chassis to haul heavy loads. Unlike many other automakers, the company never took its focus off CVs, keeping them at its core throughout. In addition to that, the upgraded Transit Connect kicks off a round of drivetrain and feature updates for its whole CV lineup. “We own work” was Ford’s slogan for years. There’s no sign that’ll change anytime soon.